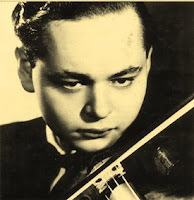 Michael Rabin was an American violinist born on May 2, 1931. He began his violin studies when he was seven. His father was a violinist in the New York Philharmonic. Heifetz, upon hearing him, recommended that he study with Ivan Galamian at Juilliard. By the time he made his Carnegie Hall (New York) debut in November of 1951, he had already appeared as soloist with a number of orchestras. Rabin recorded many of the standard concertos as well as the Paganini Caprices, one of his favored recordings. He was also said to have recorded the Moto Perpetuo by Paganini (with the Hollywood Bowl Orchestra) in one take. For some time, Rabin played the Kubelik Guarnerius (1735). He died in January, 1972.